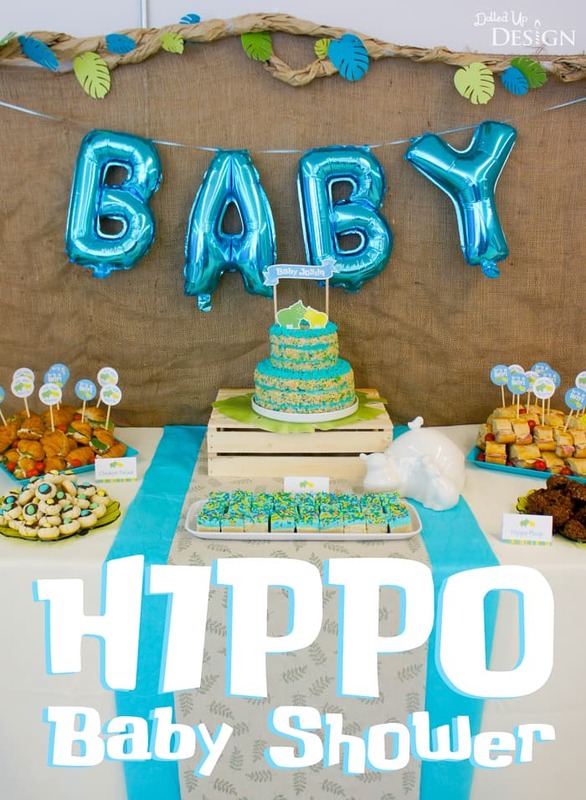 This Hippo Baby Shower article is courtesy of our contributor Chantelle…It has been a long journey for my sister to become a mom, so I was thrilled to recently host a baby shower in her honor. 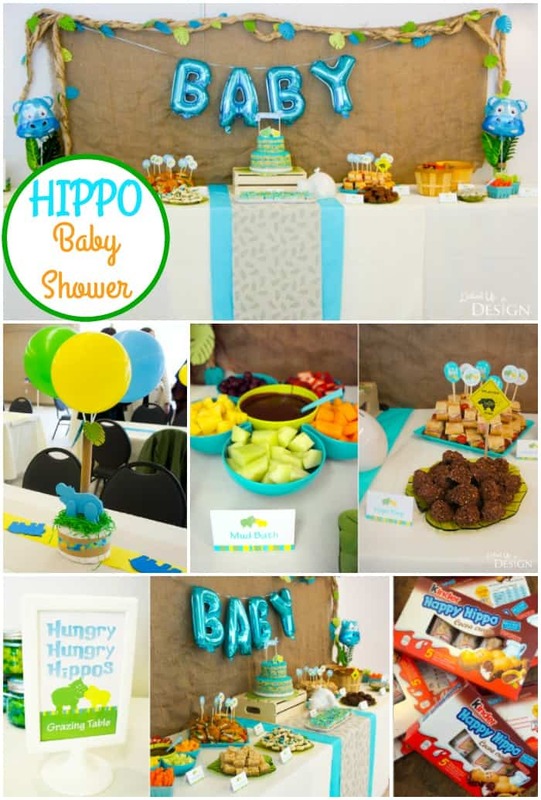 Since the momma-to-be has always loved hippo’s, it was a fun and natural choice for the baby shower theme. 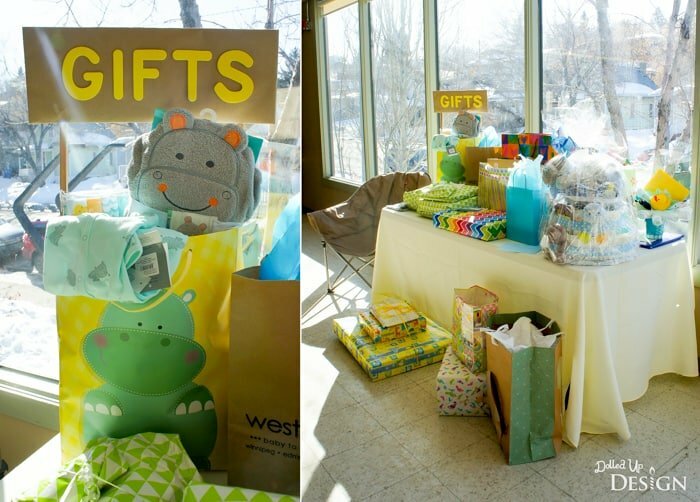 She already knows and is excited to be having a little boy, so I went with a color scheme of blue, yellow and green. 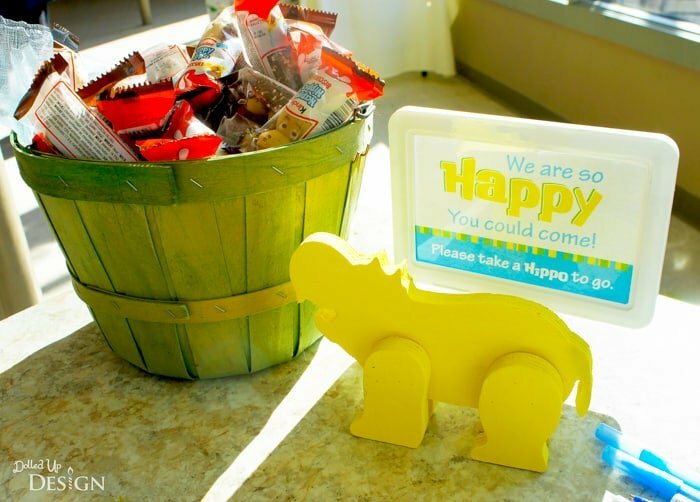 One of my first finds to fit my theme were wooden 3-D hippo shapes from the dollar store. 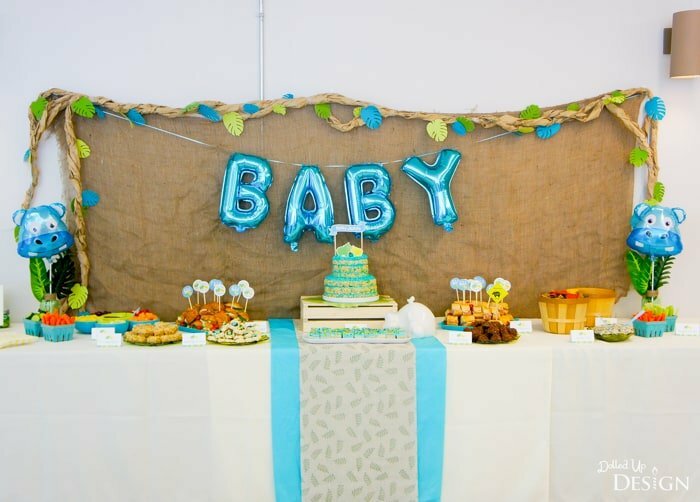 Once painted with acrylic paint, they made the perfect topper for my diaper cake based centerpieces. 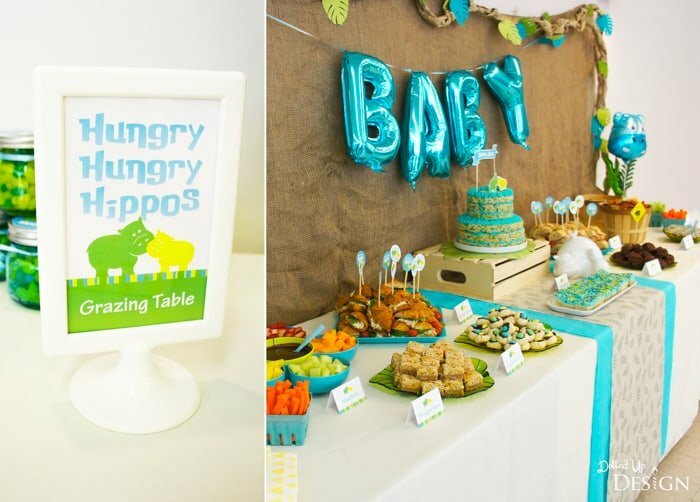 For the backdrop of the main food table, I wanted something jungle inspired with foliage and vines like you would see hanging over the riverbanks of where a hippo would live. I ordered some pre-cut leaf shapes online, and glued them to vines I made from twisting long strips of kraft colored wrapping paper. These looked great strung up around a natural burlap backdrop. 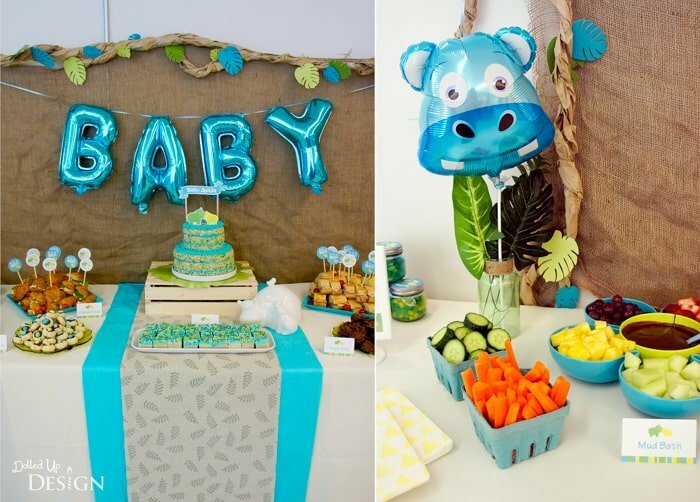 The “Baby” balloon banner was an inexpensive addition and added a nice pop of color, along with the matching blue hippo balloons in vases on either end of my food table. On the table, I layered white tablecloths with a punch of blue and a leaf printed runner. 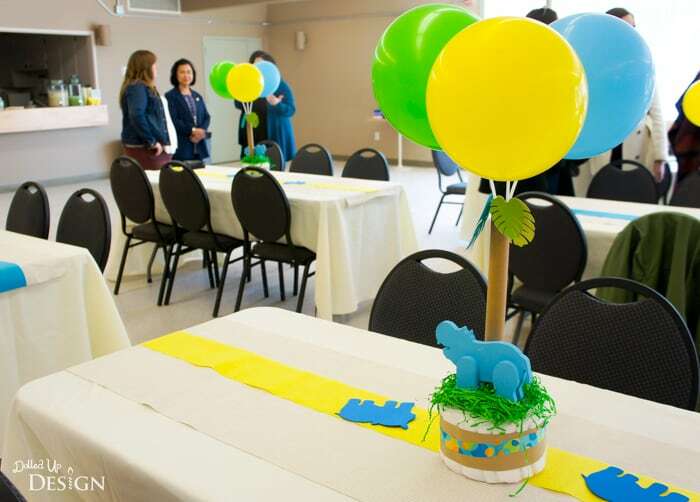 The centerpiece was a cake made of Rice Krispie treats that I decorated with a printed topper that matched the invitation. For the late afternoon timing, I decided to keep the menu to a selection of simple snacks and finger foods. 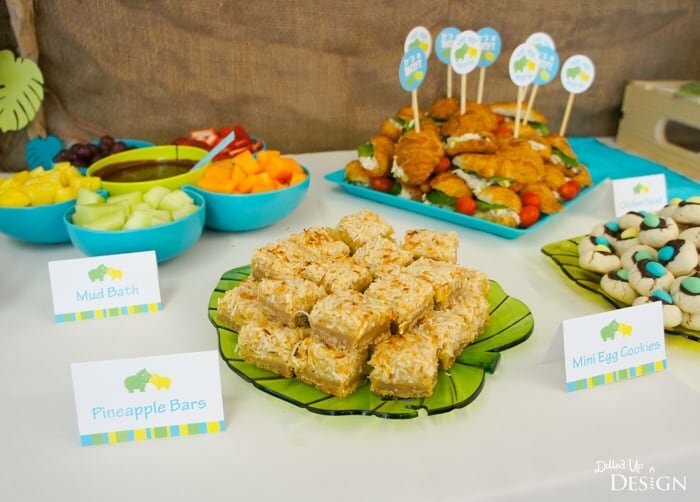 I served up small sandwiches, fresh fruit, veggies, chips and dip, plus a selection of bars and cookies. I have ordered sandwich platters from the grocery store in the past, but was happy with my decision to save a bit of money and make the chicken salad mini croissants and ham and swiss baguettes myself. 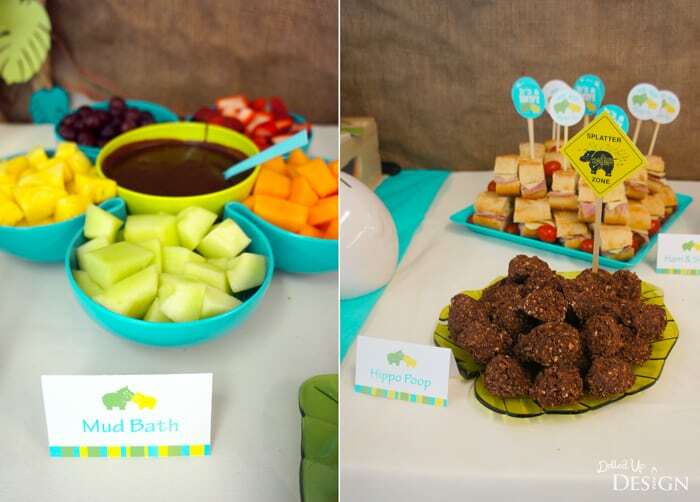 Some of the biggest hits were the store bought chocolate “mud” fruit dip and the “hippo poop” chocolate no bake cookies, complete with the Splatter Zone sign. If you have ever seen a hippo at the zoo, you will know the importance of this sign. 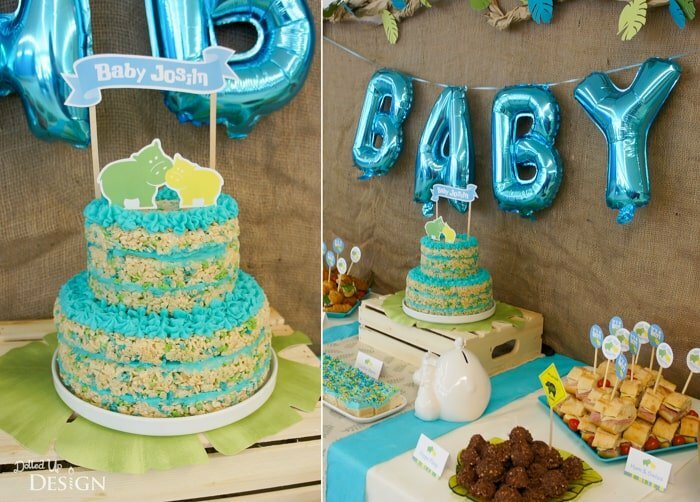 Other sweet treats I baked up to match my color scheme were mini egg cookies, sugar cookie bars and the Rice Krispie naked layered cake. I chose items I could make ahead and transport easily since the shower was 3 hours away from me. 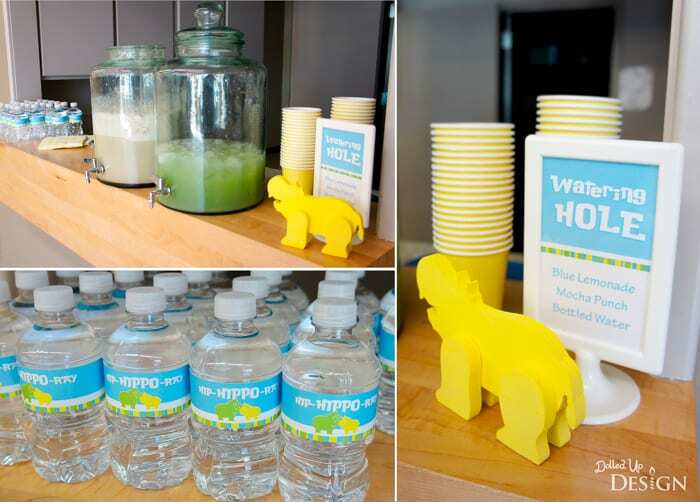 At my watering hole, I served a lemonade based punch, a coffee punch and bottled water. I used the same image and Hip-Hippo-Ray tagline from the invitation for the custom labels for the water bottles. 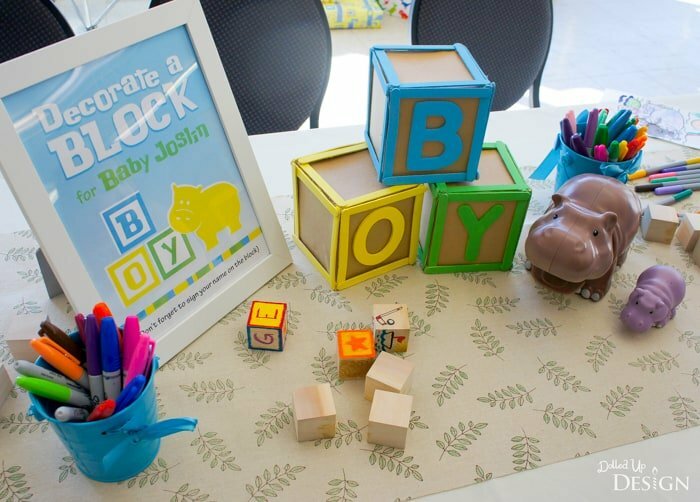 For a fun activity, I decided to order up some blank wooden blocks guests could color for baby to stack and play with as he grows. These were easily colored with a rainbow of Sharpie permanent markers, and it was so much fun to see what designs everyone came up with. In keeping with the theme, I also had a Who’s Your Mommy? Game where guests matched the name of baby animals with their adult animal. This proved trickier than expected and was a fun and easy game for guests to work on as they visited. 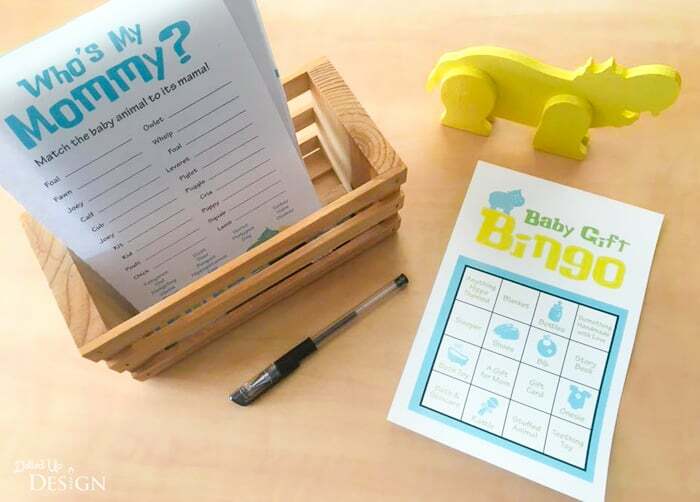 One other huge hit was a game of Bingo played while the momma-to-be was opening her gifts. Every guest was given a card and had to watch closely to see what mom was unwrapping. It got way more competitive than I was expecting and I love that it kept people engaged and entertained during the gift opening. For game prizes I decided to go with small jars containing a mixture of Jelly Belly jellybeans in my color scheme. 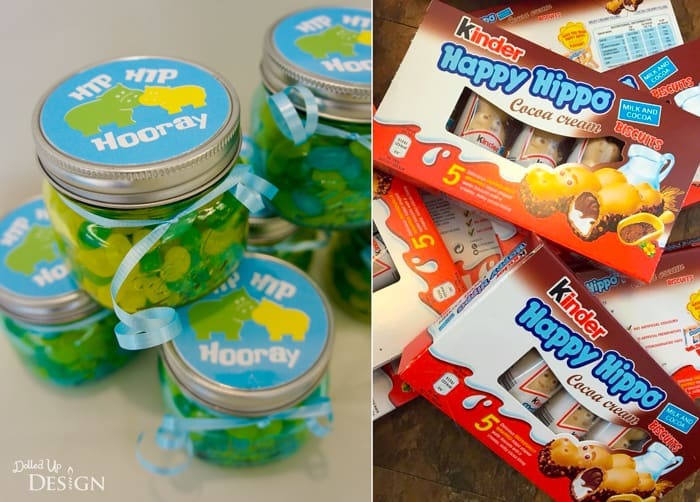 For the favors, I knew it had to be Kinder Happy Hippo’s. I have given these to my sister in the past and was excited to find a decent price on a case of 50 of them on Amazon direct from the UK. They matched the theme perfectly and they taste great! It was a lovely afternoon and I am so happy to finally get to celebrate this big moment with my sister. 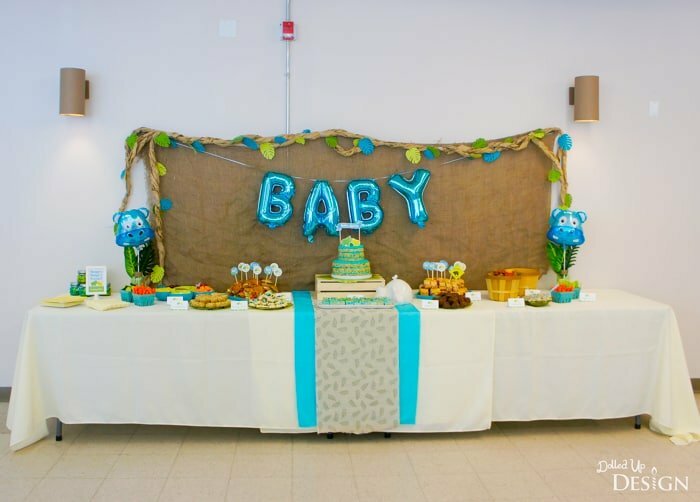 Now that the easy part of planning and hosting the shower is over for me, it is just about time for her to begin the hard and rewarding task of being a brand new mom. I can’t wait to meet him! 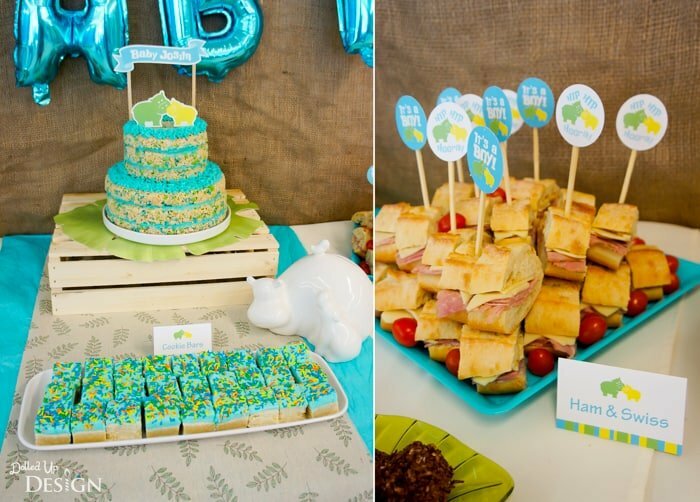 We’d like to send a big THANK YOU to Chantelle for sharing these creative party ideas with us! 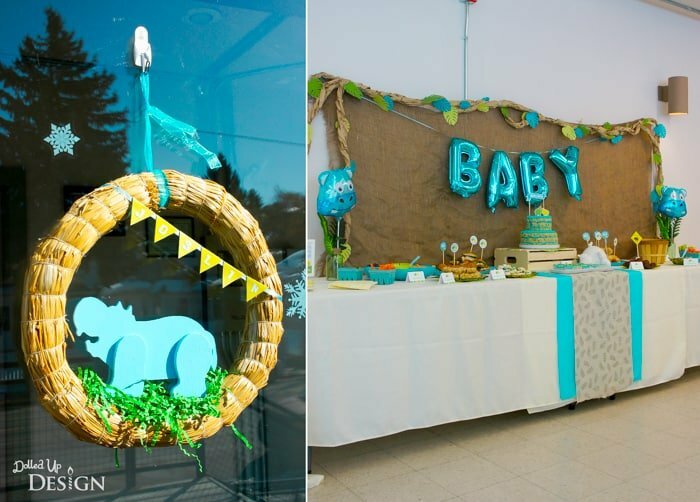 Her parties & crafts are always easy to recreate and kids love them! Be sure to follow her on Facebook to stay updated on all her fabulous ideas.